And here it is! 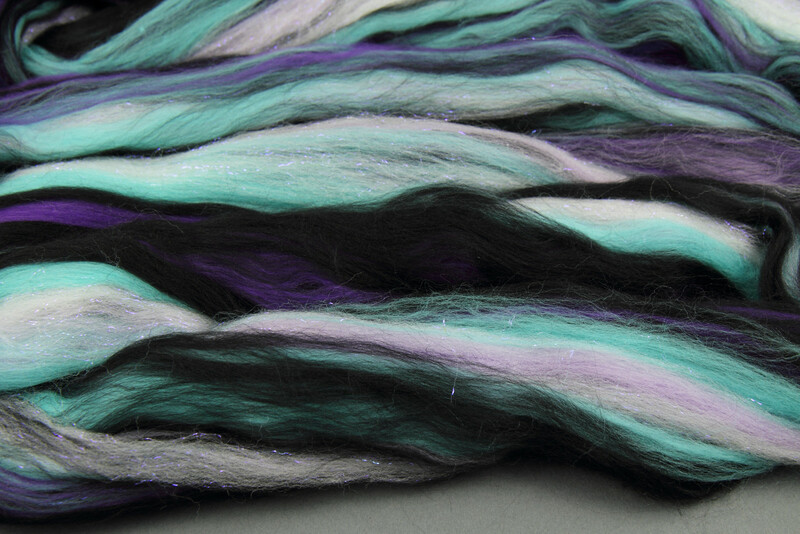 Rebel Blend is a blends of super soft extra fine Merino top with the subtle sparkle of Stellina. Using commercially dyed fibres is a first for us, but it allows us to create repeatable colourways with deeply-saturated colours alongside darks and neutrals. We added a Stellina to give Rebel Blend an extra dimension. Stellina is a fine Nylon fibre that’s soft against the skin (much finer than its sparkly cousin Angelina fibre, which can be a little scratchy). Most often it has a metallic silver tone, but we’ve used a range of unusual and iridescent shades of Stellina, especially selected to complement each colourway. We’ve launched with four colourways, let me introduce them! 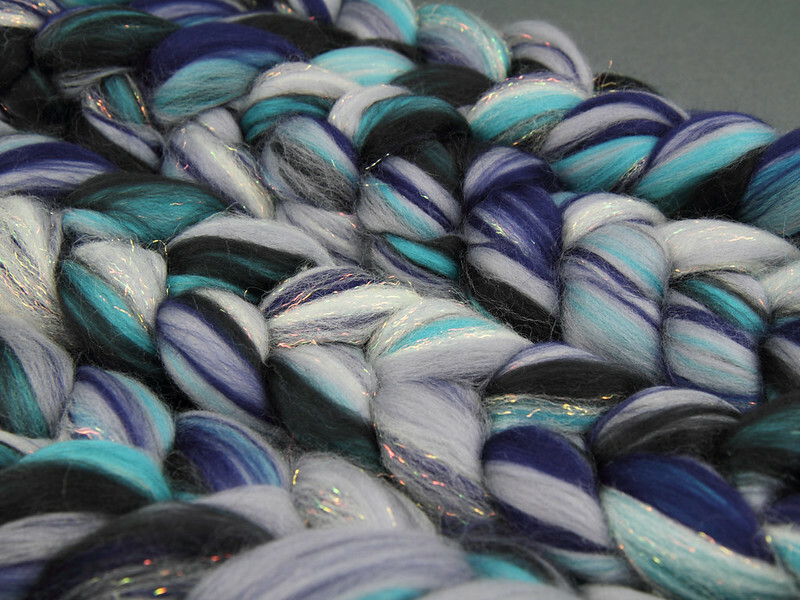 ‘Sea Squall‘ is a tempestuous character, blended of moody monochromes, deep blue and aqua. Flashes of iridescent Stellina dart through like little burst of lightning from storm clouds. ‘Patina‘ blends an unusual combination of tones: Orange, turquoise, petrol blue and black are designed to evoke weathered metal, like bronze, tarnished copper or rusted steel. We’ve used bronze stellina to complete the effect, with a warm, subtle sparkle. ‘Intergalactic‘ is a cosmic blends of purples, black and turquoise, with violet Stellina for an out-of-this-world sparkle. ‘Mumbai‘ is the boldest of all the Rebel Blends: fiery pinks and reds clash with turquoise and opulent gold Stellina. Think sari silks, exotic flowers and Bollywood glamour! All of them come in 125g braids, giving you plenty to work with. What’s it like to spin? These are soft, fine Merino fibres with a relatively short staple that can handle a lot of twist. 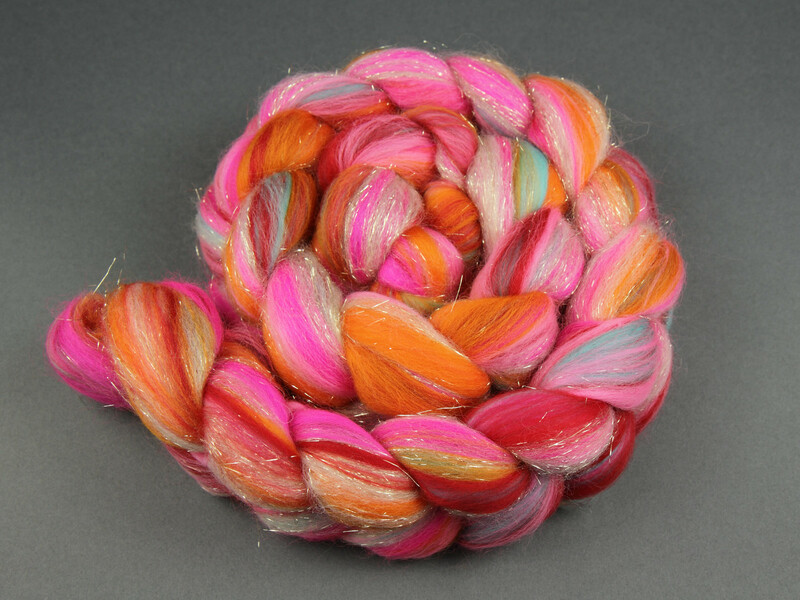 This makes it ideal for for plied yarns of any weight. It can be drafted worsted for a smooth yarn, or woollen to add more loft (though it is already quite airy due to being blended after dyeing). Singles yarns may benefit from a fulling to give them a little extra resilience. 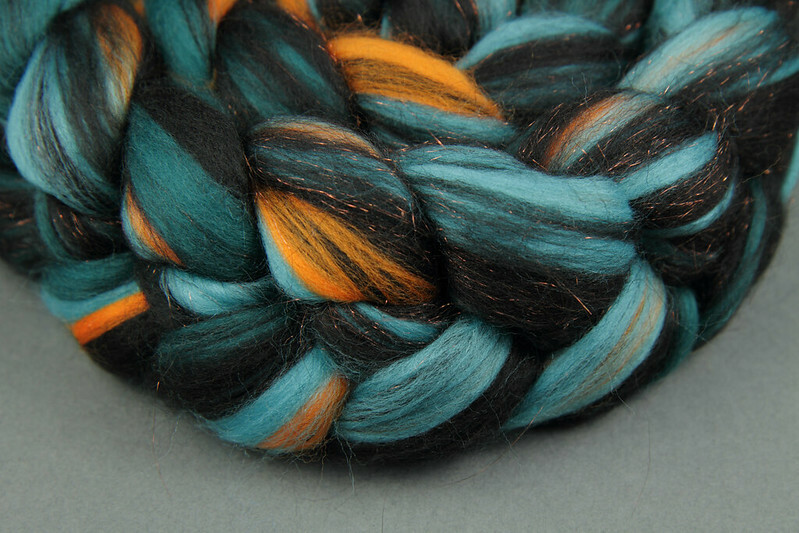 Being made from non-superwash wool, Rebel Blend doesn’t have the slippery feel that superwash Merino can sometimes have, and it is also suitable for felting projects. We’ve kept the colour blending very gentle to gives you freedom to create a variety of effects: You can keep colours separated; combination draft for a marled yarn; or even blend them further on a blending board or drum carder for a tweedy, flecked yarn. We’ll be taking some out for a spin (groan) in the next post, but in the meantime, we can’t wait to see what you do with them!